Jackson is one of my favorite Western towns. I lived there for four years before moving to Montana and loved the access to mountains and the community. 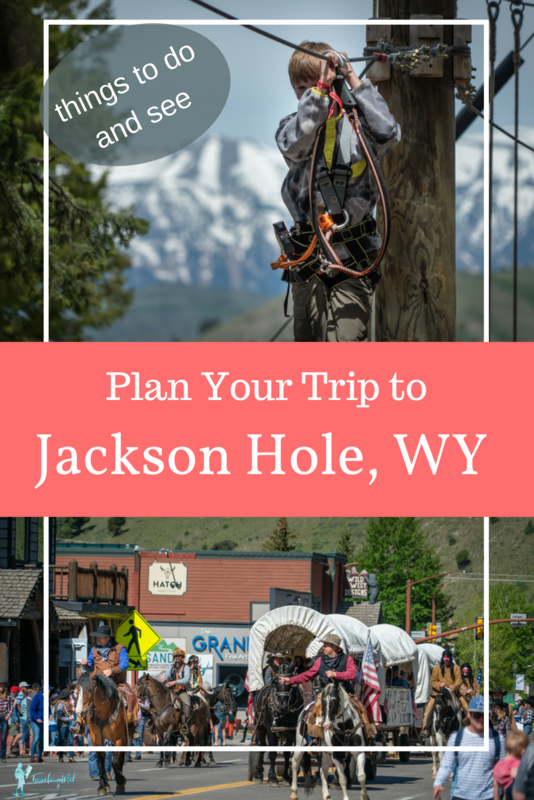 As a tourist, Jackson looks different than it does when you live there, but I’m looking forward to giving you some tips on things to do in Jackson Hole to really get to know the place, as well as some fun, touristy things to do that I’ve discovered as I’ve come back as a visitor. Honestly, some of my favorite things to in Jackson Hole are things I tried after I moved away. It can be pretty fun to be a tourist in a place you used to live. Check out the video we made on a recent visit. 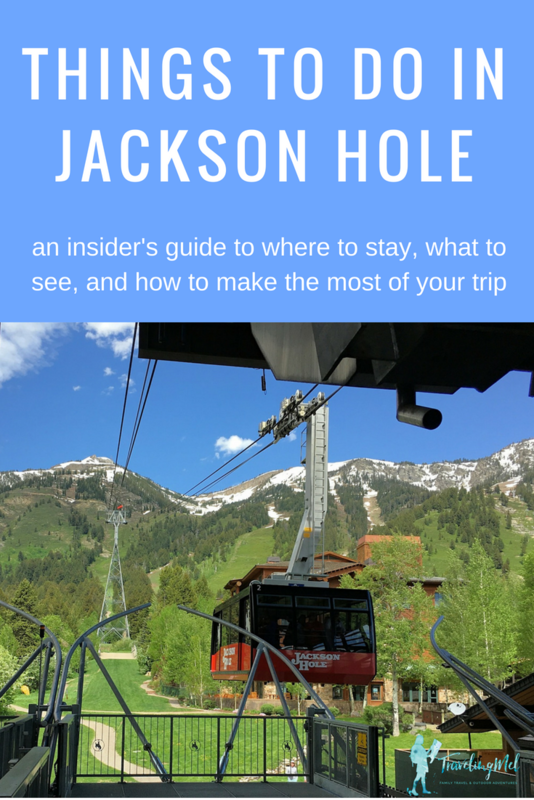 I’m including all the details in this post, plus a few other things to do in Jackson Hole in summer that we couldn’t get to when making the video. And keep reading for my favorite Jackson, Wyoming hotels to enhance your experience. Jackson is in the northwest corner of Wyoming, just south of Grand Teton National Park. It’s part of the Greater Yellowstone Ecosystem. 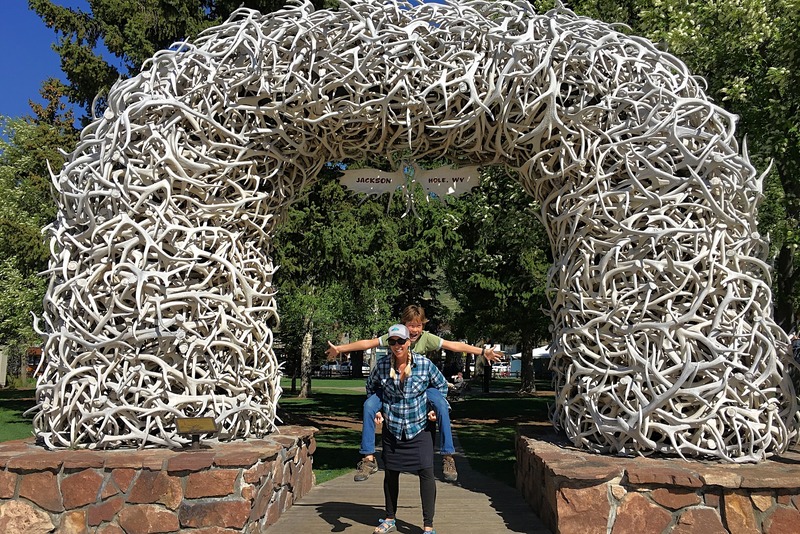 When you think about what to do in Jackson Hole, so much of it depends on its location. With an elevation at around 6,200 feet, the town is pretty high to begin with. Then you head up into the mountains and gain even more elevation. Some people feel this more than others, but everyone should remember to stay hydrated and wear sunscreen and a hat. What you’ll notice from the Jackson Hole, Wyoming map is that Jackson is a town within Jackson’s Hole (or Jackson Hole). A “hole” is a valley, in mountain man speak. People often refer to Jackson as Jackson Hole, but the hole is a much larger area than the town of Jackson. To add to the confusion, the ski area nearby in Teton Village is called Jackson Hole Resort. Got it? For a quick peak beyond the Jackson, Wyoming map, check out the Jackson Hole, Wyoming webcam. There are actually a bunch of them so you can visit Jackson Hole without leaving your computer. things to do in Jackson Hole in winter. My kids were really looking forward to all the “rides” on Snow King Mountain. 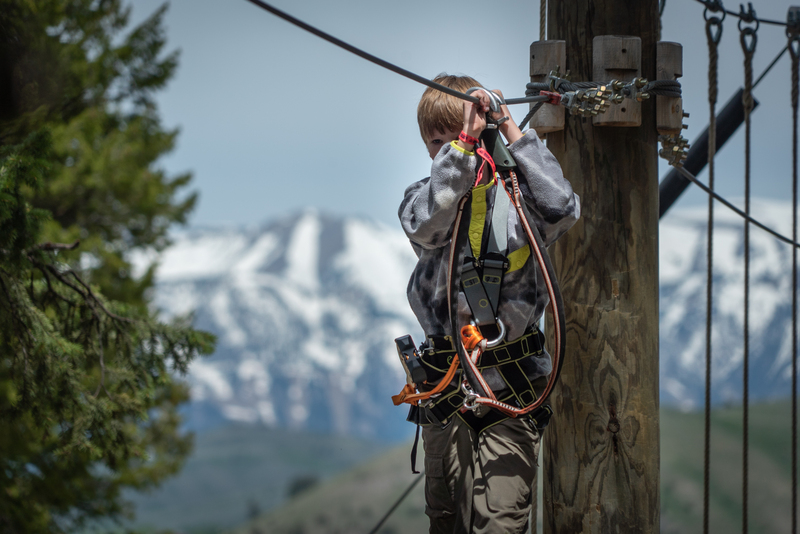 The only alpine slide Jackson Hole offers, a ropes and zipline course, a gravity fed roller coaster, and more. We had so much fun. From now on, part of Jackson Hole summer will always include at least one of these activities. You can buy each activity ticket separately or get the Big King Pass – a one-day pass that includes one tour on the Treetop Adventure, and unlimited rides on all open activities including the Cowboy Coaster, Mini-Golf, Alpine Slide, Amaze’n Maze, Bungee Trampoline and Scenic Chairlift. You can even go paragliding off the top of the mountain, but that’s a separate fee. 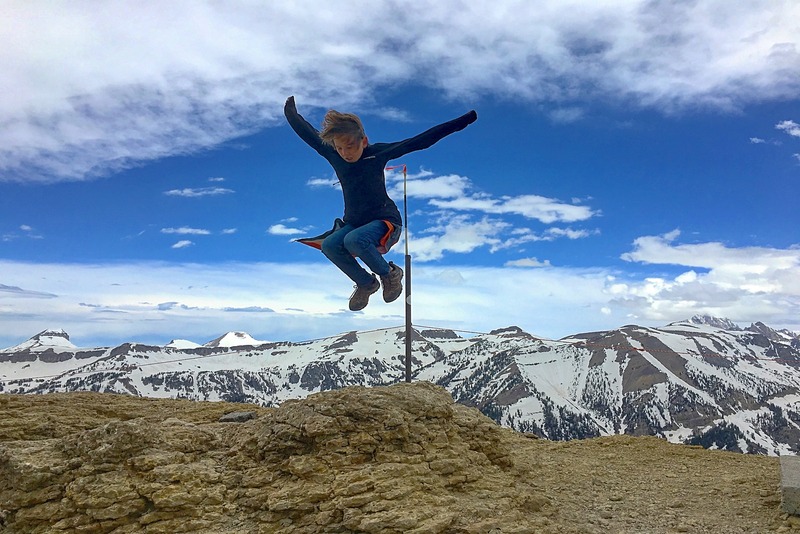 Definitely put this on your list of things to do in Jackson Hole with kids (or without) and watch the video above to see our time on Snow King. In the middle of downtown Jackson are four antler arches at the corners of Town Square. You’ll want to take a photo under one of them. Everyone does. The Town Square is a great place to eat an ice cream cone, catch a stagecoach ride, or enjoy one of the many events that take place there. Surrounding the town square are Western and tourist shops, restaurants, and many of the hotels in Jackson Hole, WY are within walking distance. There are also a lot of art galleries and other cute shops. Make time to walk around a bit on your visit. 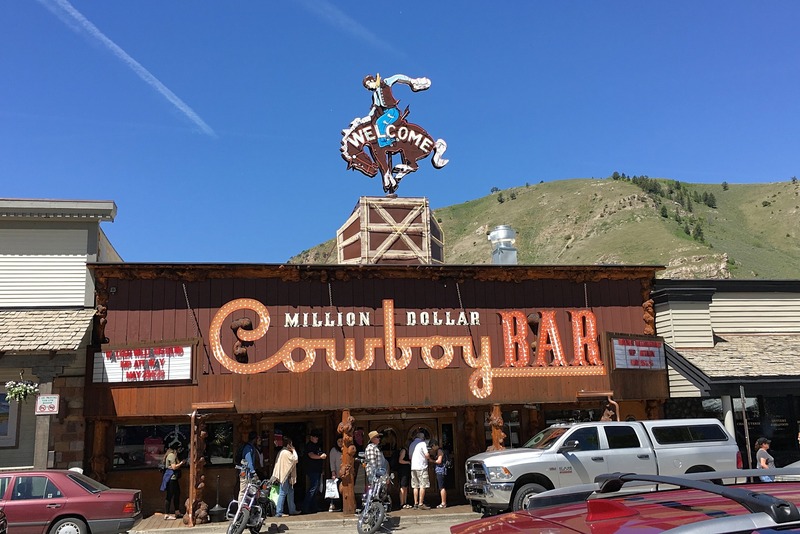 And don’t miss popping into the iconic Million Dollar Cowboy Bar. 25 N. Cache St. There are many things to see in Wyoming and a lot of them are in Jackson. Find more of them on the Jackson Hole Chamber of Commerce website or Jackson Hole Resort events. 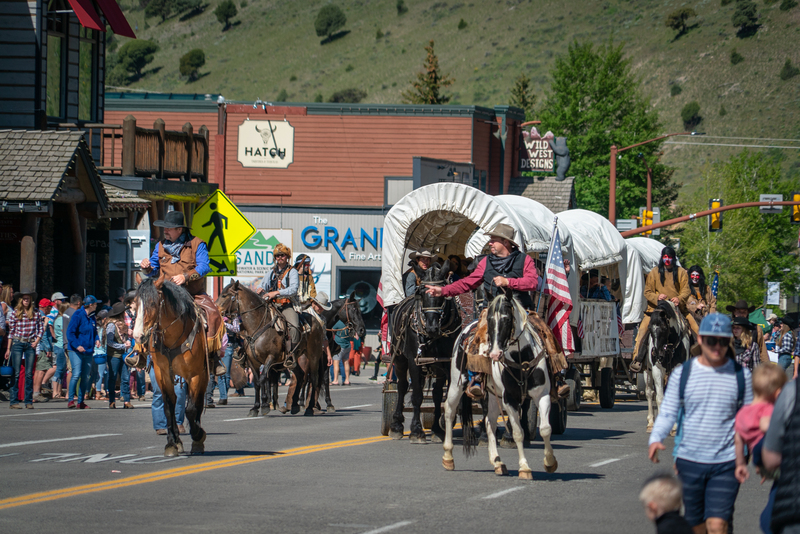 For smaller and more local events, see Planet Jackson Hole. 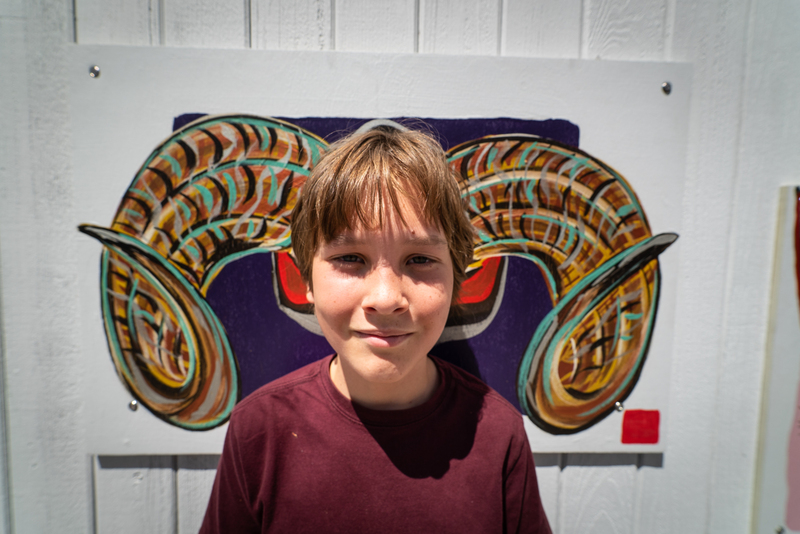 And the Jackson Hole Center for the Arts always has something interesting going on. One of my favorite things to do when I am in Jackson is hike. 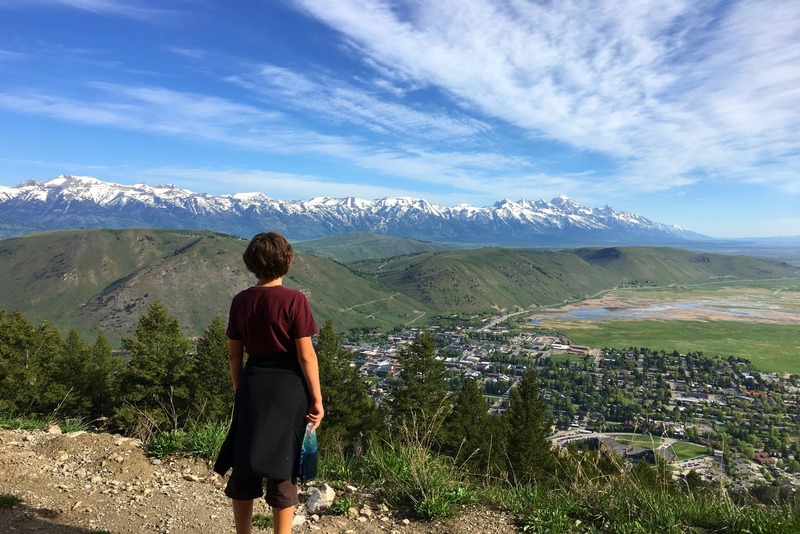 The best hikes in Jackson Hole leave right from town, meaning you don’t even need a car to get to the trailhead. The other nice thing is that you can often fit a hike in before you get going on your other Jackson activities. Snow King Summit Trail – 2 miles one-way, start at the base of Snow King and follow the signs to the top of the hill. A lot of people use this as their workout trail as you climb more than 1,500 feet. Great views from the top. Josie’s Ridge – 1.5 miles one-way, start at Flat Creek. This is another steep one that takes you to the top of Snow King. I love this route up “The King.” You can make it a loop by coming down the Snow King Summit Trail. Cache Creek Trail – variable mileage, start at the east end of Cache Creek Dr. This trail is popular with locals and their dogs. You won’t be alone, but it’s a pretty walk. 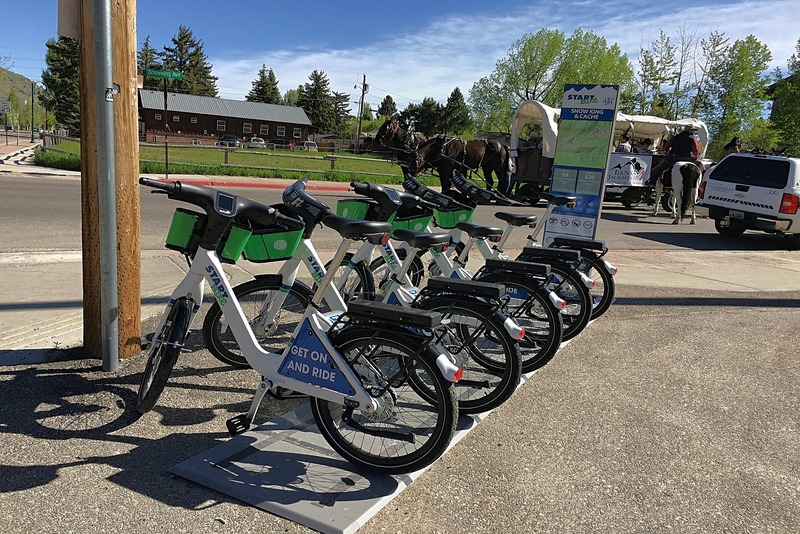 Jackson Hole Community Pathways—variable mileage, various start points. For something leisurely, ramble along Flat Creek or head farther afield. Find more local hikes in Jackson here. Of course, there are tons of other trails outside of Jackson in the Tetons and the Gros Ventre Mountains. In summer, biking tops the list of things to do in Jackson, WY. Cruise the Jackson Hole Community Pathways around town, to Grand Teton National Park, to Teton Village, or south of town. I like the section along Flat Creek. Jackson has a new bike share program. You download an app on your phone, pick up a bike at one of the stations around town and return it to the same or different station. I can’t wait to try this out. Check out Start Bike here. Want to rent a bike in Jackson? There are several options: Hoback Sports, Jackson Hole Resort, Teton Mountain Bike Tours, e-Bikes of Jackson Hole. 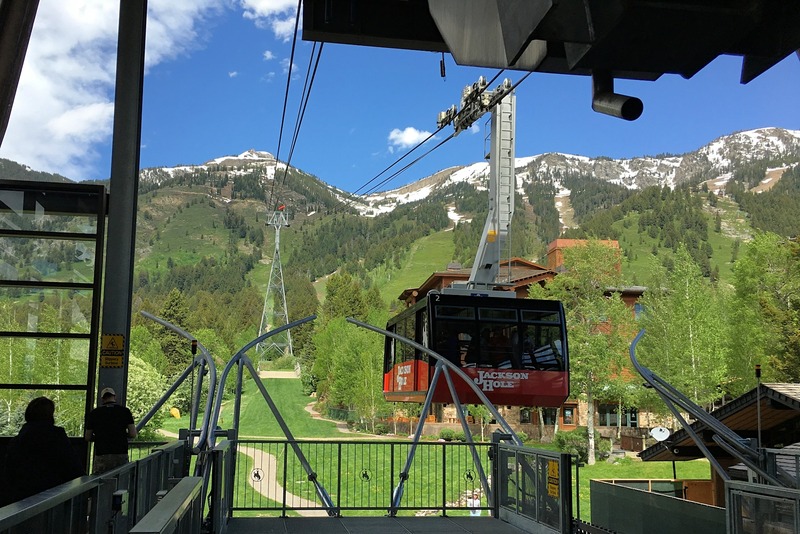 One of the best ways to get up high in the mountains without doing any work is taking the tram at Jackson Hole Mountain Resort. It’s a scenic ride to the top and along the way the tram driver (tram operator?) tells you about what you are seeing and plays a recorded interpretive message. People have seen bears, deer, and other animals from the tram. We didn’t see any animals from “Big Red,” but the views of the surrounding mountain ranges, and Rendezvous Mountain itself, were stunning. 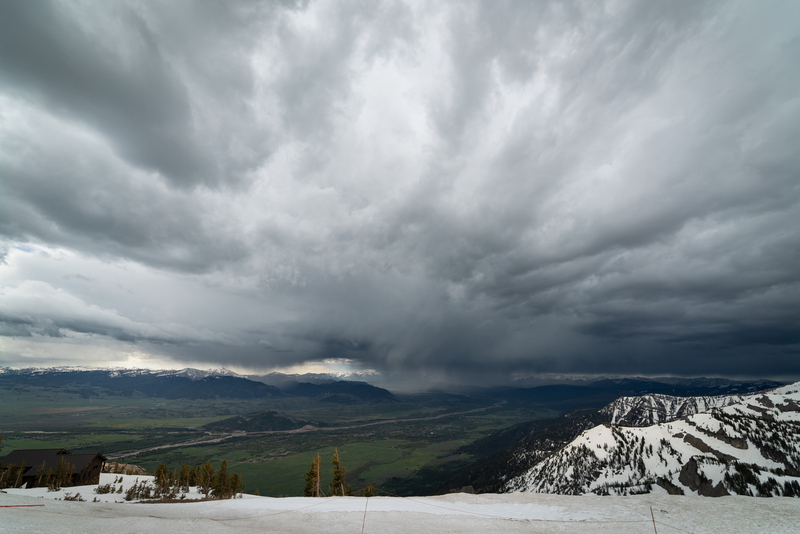 At the top, get a 360-degree view of the Tetons, Wyoming, and into Idaho. We could even see the Grand Teton poking above the other mountain peaks. Grab a waffle at Corbett’s Cabin, we recommend the lemony Englishman, and a drink before exploring the trails at the top of the range. You can take the tram back down to Teton Village or walk down the seven miles of gravel road, which is what Anders and I did. You can also walk up to the top of Rendezvous Peak from the base, if you want to skip the tram. There are other things to do in Teton Village besides ride the tram, so you could make a whole day of it. Teton Village and the Jackson Hole Mountain Resort are about 12 miles from the town of Jackson. Parking is free in the summer. Here are just a few of the options. Kids Ranch with day camp offerings. Hiking – If you are looking for a guide, we recommend Hole Hiking Experience. Ask for Heather, but if she is booked, all the guides are great. I have to admit that I thought a chuckwagon dinner would be a little too cheesy for my Jackson Hole vacation, but it turns out I loved it. 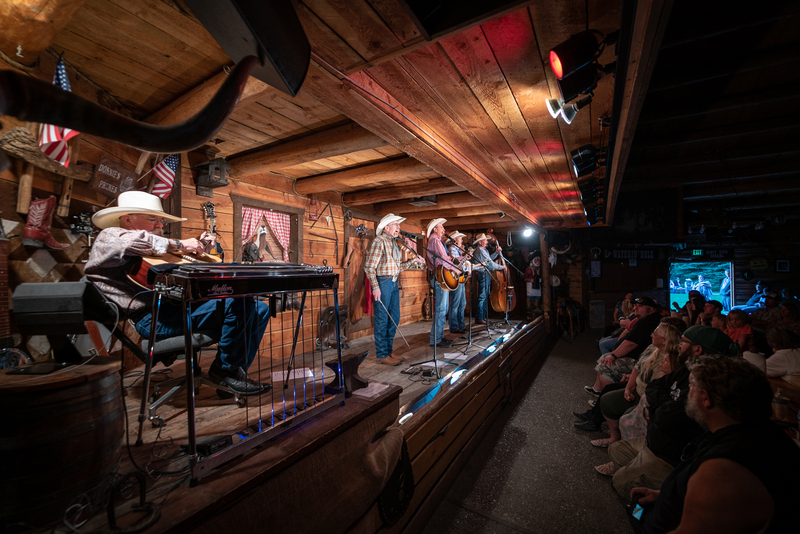 The Bar J Chuckwagon is basically a Western dinner and show in a three-sided barn-like structure. They serve a lot of people really efficiently and well. The evening starts out with seating and an introduction, then you get your food from the chow line –steaks, chicken, BBQ beef, BBQ pork rib, or veggie burger along with baked potato, beans, biscuit, apple sauce, and spice cake. After you eat and clear the tables, the Bar J Wranglers take the stage. This was the best part of the night. The stories, singing, music, yodeling, and jokes kept us all entertained. It’s a good idea to make a reservation. Start the evening with a covered wagon ride up Cache Creek to the cookout area. There they serve a Dutch oven meal of chicken and/or roast beef, corn on the cob, beans, rolls, and salad. Next up is the Bar T 5 Band with music, stories, and jokes. Finish the evening with the ride back to the parking lot in the horse-drawn wagons. Make a reservation here. Stop by Vertical Harvest, Jackson Hole for a tour of their vertical greenhouse and one of the more unique things to do in Jackson. This 13,500 sq. ft. three-story stacked greenhouse utilizes a 1/10 of an acre to grow an annual amount of produce equivalent to 5 acres of traditional agriculture. 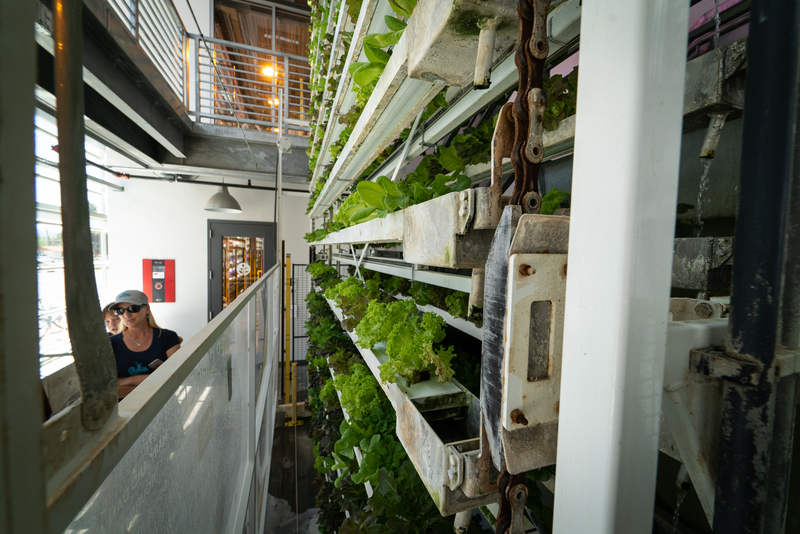 The trays of greens, microgreens, and tomatoes rotate in front of glass windows to ensure the proper amount of sunlight. Also, cool is that they employee developmentally disabled people to work there, creating jobs for a sector of the population that can have a hard time getting employment. Tours every Wednesday, Friday and Saturday at 1:00pm. 155 W. Simpson Ave. I could write a whole post on Jackson Hole eateries. There are so many good restaurants. We’ve only sampled a handful, but here are my favorite food spots. San Juan Restaurant – (Formerly called Taqueria Sanchez) is a little authentic Mexican restaurant on the corner of Glenwood and Pearl. The soft tacos are delicious. It’s a casual, easy place to grab lunch when you are downtown. Inside and outside seating. 75 S. Glenwood St.
Liberty Burgers – As a vegetarian, I’ve never been drawn to a burger place, but people like this one and you probably will, too. This chain is known for their burgers, of course, but people like me can get a grilled cheese. 160 N. Cache St. The Kitchen – Words like “simple” and “elegant” are usually thrown around when describing The Kitchen. I like the long, patio for summer dining. I’m not sure exactly how to describe it, but I’d call it “Asian-inspired.” 155 Glenwood St.
With the Snake River flowing through Jackson Hole, there are plenty of opportunities for whitewater and scenic rafting in Jackson. A lot of companies pick you up at your hotel, or have you meet at their office, then drive you out of town for the put-in. The whitewater section is in the Snake River Canyon – a beautiful, treed canyon that’s worth seeing even without the boat trip, and the class III rapids are fun! This is on the top of our Wyoming things to do list. We loved whitewater rafting in Bosnia and can’t wait to try it closer to home. Barker-Ewing Whitewater, Mad River Boat Trips, and Sands Whitewater and Scenic River Trips all do about the same thing and all have good safety records. I’d feel good about going with any of them. Whether you want to fly fish on the Snake River as it winds through Grand Teton National Park, cast to bigger fish on the Green River, or challenge yourself on Flat Creek in the National Elk Refuge, you’ll find a fishing trip that suits your desires and abilities. There are a lot of Jackson, Wyoming things to do, but fly fishing beneath the Tetons seems especially iconic. Check TripAdvisor for the best rated guides and latest prices. For horseback riding, Jackson Hole is the place to go. The town has a long history of horseback riding, cowboys, and ranches. You can stay at a dude ranch (see lodging options below) and ride or take a half-day or full-day ride while staying elsewhere. If you want to ride in Yellowstone, see my post of our ride with Wilderness Pack Trips –they’re the best. Check TripAdvisor for the best rated horseback guides and latest prices. South of Jackson, in Hoback, Wyoming there is a hot spring we love. It’s a little effort to get to – it’s an hour drive from Jackson with the last ten miles on a dirt/gravel road—but worth the effort (see the map here). I’ve cross-country skied to Granite in the winter and driven in the summer; it’s always beautiful. Granite Hot Springs pool is on the Bridger-Teton National Forest located just upstream from Granite Falls. The area is forest and alpine meadows. Hiking trails lead from various spots along Granite Creek Road. I can’t emphasize enough how pretty this place is. It must have one of the best views from a hot spring in Wyoming. The water temperature varies with runoff – it’s cooler in early summer and warmer in fall and early winter. Call ahead in spring and early summer to make sure the road is open. Granite Waterfall is about 0.5 miles downstream from the developed hot springs and accessed from a road in the campground. A couple of hot pools about 50 yards below the falls can make for perfect soaking spots at the right time of year. They may be overrun with cold water in spring and early summer. Astoria was a popular family and community gathering place for years before it closed down in the 1990s. The Trust For Public Land is working on reopening the hot springs and park in 2018. There are claims of potentially deadly amoeba in the Huckleberry-Polecat Hot Springs, so soak at your own risk. I’ve soaked in them, as have others I know, but I can’t advise you to do it. I don’t know if it is because it’s on National Park Service lands and they are more cautious than other landowners (there are similar warnings for the Boiling River in northern Yellowstone), or because there really is something different about these hot springs. I suggest Jeff Birkby’s Touring Montana and Wyoming Hot Springs for more details on these hot springs near Jackson and how to get there. You probably don’t have a lot of time to spend in Jackson, so make the most of it with this plan for 3-days in Jackson Hole. If you only have two days, skip the least appealing day on this itinerary. For planning a trip to Yellowstone, see my Yellowstone itineraries. AM – (1) Snow King Mountain Activities. Choose one activity or get the Big King Pass and do them all. AM – (1) Take the tram to the top of Rendezvous Mountain at Jackson Hole Mountain Resort. (2) Hike the mountain top trails and (3) get a waffle at Corbett’s Cabin. PM – (4) Drive north from Teton Village into Grand Teton National Park at stop at the Laurence L. Rockefeller Preserve Visitor Center or the Craig Thomas Discovery and Visitor Center in Moose. (5) Grab a drink or snack at Dornan’s in Moose and head back toward Jackson, stopping at the (6) National Museum of Wildlife Art. AM – (1) Start the day with an in-town hike or bike ride on one of the local trails. PM – (2) Choose between rafting or fishing on the Snake River or soaking in Granite Hot Springs. Download the Jackson 3 Day Itinerary here. Of all the Wyoming attractions, Grand Teton National Park must top the list (Yellowstone, too). The mountains rise straight from the earth without foothills and kiss the sky. They really are remarkable. I could stare at them all day. Start at the visitor center in Moose, Wyoming to plan your trip. We like taking the boat across Jenny Lake and hiking to Inspiration Point. It’s crowded, but a nice, steep walk with great views. For something mellow, consider the Leigh Lake or String Lake Loops. Since this post is about things to do in Jackson, I will leave you with these suggestions and cover the park more in another post. For a quiet visit, stick to Colter Bay in the north end of the park. There is no shortage of Jackson Hole lodging. Whether you want to stay at one of the high end, luxury Jackson Hole resorts or pet friendly hotels in Jackson, WY, you’ll find something. The trick is finding reasonably priced motels in Jackson, WY. Make your reservations as far in advance as possible for the best rates and availability. The Amangani luxury boutique hotel situated in a scenic valley between the town of Jackson and Teton Village is known for good food and service. This is a favorite of the Jackson Hole, Wyoming hotels that people come back to over and over. Find the best deals and see current prices for the Amangani. If you like to take Fido or Tweety on vacation, you are going to need a pet friendly hotel. Luckily, many of Jackson, WY lodging options will welcome your furry or feathered friend. The Flat Creek Inn is a good value and every room has a view of the Elk Refuge. The Mountain Modern Hotel has a limited number of dog-friendly rooms, make sure to reserve one specifically. The rooms are simple and…modern! It’s close to the Town Square and Snow King. Find the best deals and see current prices for pet friendly hotels in Jackson Hole. 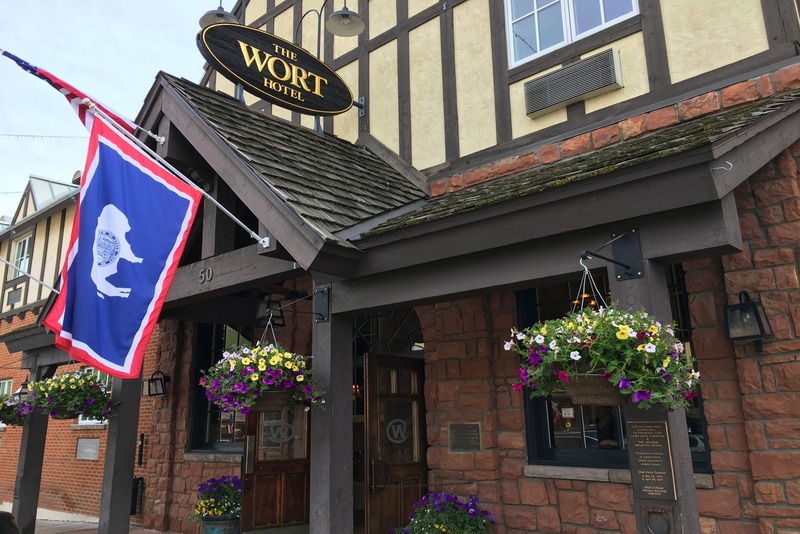 The Wort Hotel is our go-to Jackson, Wyoming lodging. It’s conveniently located about half a block off the Town Square and an easy walk to Snow King and everything else in Jackson. The rooms are well appointed and nice (my youngest especially liked the teddy bear). It is very Western and has a rich history. Now the Silver Dollar Bar and the Million Dollar Cowboy Bar are owned by the same person as the hotel. We also appreciate that they have their own private parking area so you don’t have to search for parking in downtown. The Antler Inn Jackson, WY, is one of the Town Square Inns. We’ve stayed here in the past and they have updated the carpet and bathrooms since then. This is one of the motels in Jackson Hole, Wyoming close to the Town Square and everything else in Jackson. If you prefer to stay outside of town, there are plenty of options for lodging near Jackson, WY that is quiet, scenic, and relaxing. You’ll get more of the mountain wilderness feel than the in town motels. The Hampton Inn Jackson, WY, is in Jackson, not in downtown. You can drive to the Town Square in five minutes or take an eight-minute ride on the Start Bus. Sometimes it’s nice to be out of the hubbub. Rooms are clean, the staff is wonderful, and it’s close to grocery stores and restaurants. The Alpenhof Lodge is in Teton Village. 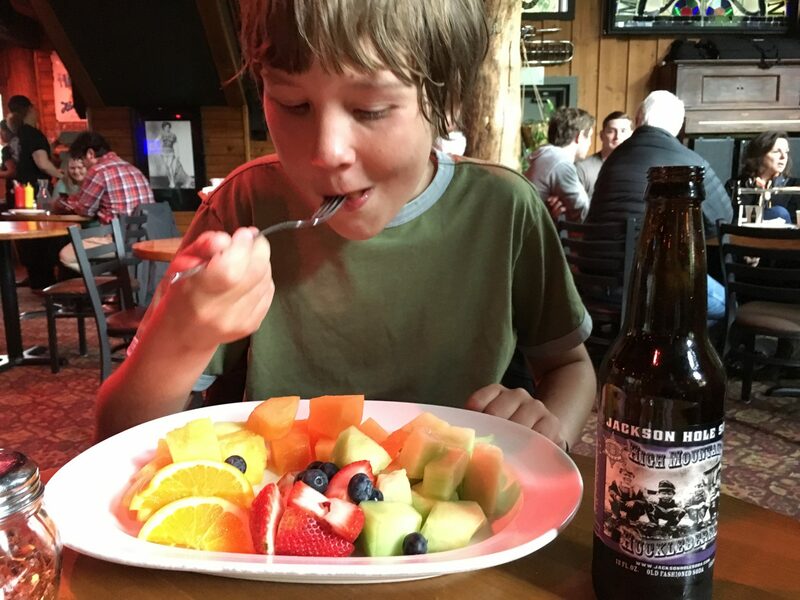 It’s a charming, Bavarian style hotel with great breakfasts and cozy rooms at the base Jackson Hole Resort. It’s a smaller hotel, so you get plenty of personal service. Close to the entrance to Grand Teton National Park. If you want a more outdoorsy experience in or near Jackson, Wyoming cabins might be the way to go. It’s camping without the tent and sleeping bag, but with the stars and s’mores. Snake River Park KOA and Cabins, about 10 miles south of Jackson and adjacent to the Snake River, has a grown-up summer camp vibe. The cabins have a kitchenette, flat screen TV, and full bathroom. They run horseback riding and river trips from the cabins, so you can have a full adventure right there. There are also tent and RV sites. Click here for the best deals and current prices. Dornan’s Spur Ranch Cabins include 8 one-bedroom and 4 two-bedroom cabin duplexes. The cabins are furnished with handcrafted lodge pole pine furniture and have queen size beds with down comforters. The kitchens are fully equipped and the living/dining area consists of a sofa and chairs and a dining table that seats four to six. Appliances include a coffee maker, toaster, gas range and a full-size refrigerator/freezer. Each cabin has a covered porch and BBQ grills on pads adjacent to the porches for guests to enjoy during the summer season. This Moose, WY lodging is right in Grand Teton National Park. Views are to die for. On the other end of the spectrum, this cabin, is more luxury log home than cabin, on the edge of Grand Teton National Park. With leather furniture, a stone fireplace, handmade knotty pine finishes, Western antiques, a hot tub, sauna, and incredible views, you will feel like you are staying on a movie set. Click here for current prices and reservations. There are several hotels in Grand Teton National Park. The most well known is the Jackson Lake Lodge and you can’t beat the view out the lobby windows or from the deck. The cottage rooms are nice, but not as high end as at the Jenny Lake Lodge. Find the best deals and see current prices for the Jackson Lake Lodge. Jenny Lake Lodge has four-diamond cabins near Jenny Lake at the foot of the Tetons. The Signature Stay Package includes a full gourmet breakfast and a nightly five-course rotating dinner menu. Also included are horseback riding, the use of cruiser bicycles, and other complimentary daily guest activities. Colter Bay Village has cabins and camping and Headwaters at Flagg Ranch has cabins. Both of these lodging options are at the north end of the park, close to Yellowstone’s South Entrance. Signal Mountain Lodge has the only lakefront lodging in the park. They have one-room mountain cabin units, suite style units with kitchenettes, and amazing views of the Grand Tetons. Regardless of what the weather reports predict, be prepared for foul weather. It’s really hard to accurately predict weather in the mountains. Jackson isn’t the easiest, quickest, or cheapest place to get to. You can fly into the Jackson Hole Airport (JAC), which is just north of town in Grand Teton National Park. From there you can rent a car or get a shuttle into town. The nicer hotels will pick you up at the Jackson, Wyoming airport. There are plenty of flights to Jackson, Wyoming, from just about anywhere, but you will likely have to fly through another airport, maybe Denver or Salt Lake City, first. There aren’t any other airports near Jackson Hole, Wyoming, but a lot of people fly to Salt Lake City, Denver, or Bozeman and then rent a car. You can even fly to Idaho Falls Regional Airport, which is the closest airport to Jackson (other than JAC), but also a small airport. “What’s in Wyoming?” I hear you ask. It seems like a big prairie without much to offer, but that couldn’t be farther from the truth. 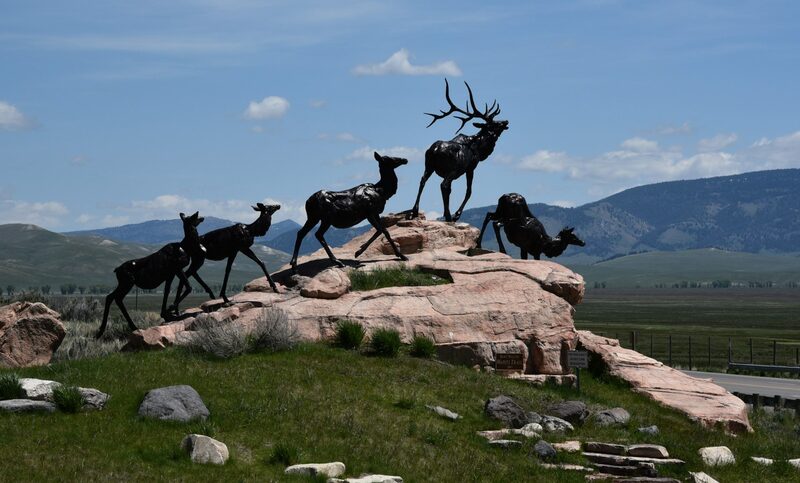 There is so much to do in Wyoming beyond Jackson Hole and Grand Teton National Park. This list just scratches the surface, but it’s a good start. One of the best places to visit in Wyoming (and Montana and Idaho) is Yellowstone. It’s just north of Grand Teton, separated by the Rockefeller Parkway, and many people combine a Jackson family vacation with a visit to Yellowstone.